Sweet Georgia Soul is the second sauce from Southern Soul BBQ (St. Simon Island, GA) to be reviewed on The "Q" Review. I previously reviewed their mustard sauce, Low Country Soul. 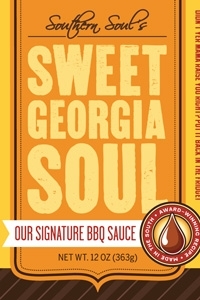 Sweet Georgia Soul is one of four Southern Soul flavors, and is considered their "Signature BBQ Sauce." All Southern Soul sauces are packaged in slim 12 oz glass bottles. Sweet Georgia Soul is burnt orange in color with large flecks of black pepper scattered throughout. The has a medium thickness making it versatile enough for just about any application. The sauce is a ketchup and mustard blend which accounts for the color. Though Ketchup is the primary base ingredient, the mustard flavor comes through clearly. The sauce is also sweetened with additional sugar. The finish is tangy from the apple cider vinegar and has a slight pepper spice. Sweet Georgia Soul displays many of the same characteristics as other Georgia made sauces that I've sampled. The blending of sweet and tangy flavors creates unique sauces not found in most regions of the country. Obviously influenced by the mustard and vinegar traditions of the Carolinas, Georgia has created a BBQ identity all its own. I used Sweet Georgia Soul this weekend on a rack of slow smoked spareribs. The sauce's unique blend of flavors was a good compliment to the smokey pork. When heated, the sauces flavors were sweet and mild. The sauce created a nice dark orange glaze on the ribs when used as a finishing sauce. Sweet Georgia Soul worked well as a glaze on the ribs, but I think it may be best served on chicken and pulled pork. I prefer the flavor of the sauce after it has been heated. Use it as a glaze or dip. Either way, I recommend Sweet Georgia Soul for anyone who enjoys a mild mustard or vinegar tang. Check out Southern Soul's website for more information on Sweet Georgia Soul and their other products. See how Sweet Georgia Soul rates on our "Product Reviews" page. 2 Response to "Southern Soul BBQ Sweet Georgia Soul"